Eating leftovers is great, but I hate the "out of a tupperwear" feel of it. So - the "out of a tupperwear" roasted red pepper sauce pasta gets plated and garnished with chopped parsley and parmesan (from this morning, prepared while eating a bowl of cereal), packed separately to keep everything fresh. Now it feels like a proper lunch! 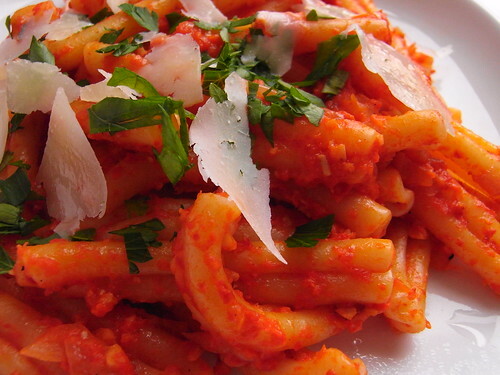 what a beautiful red sauce. i must try making it! Nice! I've done that with an egg drop soup - put shredded spinach and grated parmesan in separate bags, to add to reheated soup for a sort of stracciatella alla fiorentina. Only sort of. This is a great idea! I often don't bring lunch b/c it always feels so sad after I heat it up. I am totally going to bring "fresh" garnishes and things to liven up my occassional tupperware lunch! Tupperware is what makes it the best.